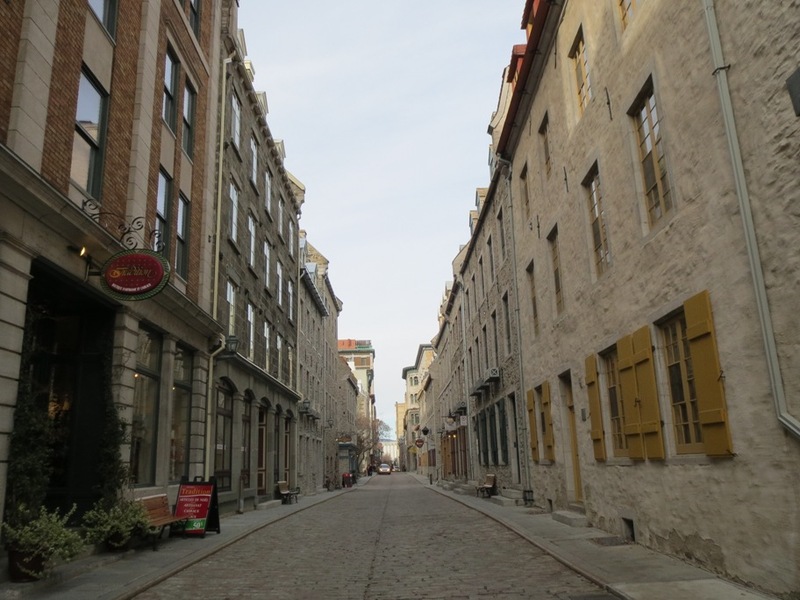 This is a series of articles about a romantic trip I took to Quebec City. I go over the ways I used the information that I share on this site to have a great trip for a very low price. He says: She turned to me and told me how happy she was. It was the perfect time to finally pull out the box I had been covertly carrying in my jacket pocket (I had been avoiding close hugs to escape detection). It was also the perfect time to ask the question I had been carrying in my heart. The only barrier was the cup of coffee she was holding. He says: Looking at me as if I had asked her the most basic question, she answered without a moment’s hesitation: “Of course I will marry you”. I recently went on a romantic getaway to Quebec City, where I asked the love of my life to marry me. It was a great trip and I was so fortunate that I was able to do it. Using much of the knowledge that can be gained from reading my other articles, I was able to do this trip without breaking the bank. We were able to have a very lavish, upscale weekend getaway for less than what the regular price of an average trip might cost. Tip: When going on a trip where you might have people helping you out (ie Bellhop, taxi drivers etc.) I suggest taking a few US$1 bills. I find tipping using C$1 coins and C$2 coins is very awkward, while tipping in bills is much more acceptable. Quebec City is such a romantic city. I thought it would be the perfect place to share this moment. Quebec is the only fortified city in Canada, and the city inside the walls is full of rich history. It is as if every corner of the old town would make for a great romantic backdrop. Quebec City is also relatively close to Toronto, where I live. One of the advantages here, is that it is not a “big” trip where we really would have to budget a lot of time for travel by air. Quebec City is a quick flight away or about 8 hours driving away. This means that in the future, when we want to share our 10th anniversary with our kids (hopefully), going to the site of our engagement will not be a very difficult task. Finally, one of the huge advantages that I learned, only after arriving on the ground, is that Quebec City is relatively cheap, compared to Toronto. What I mean is that the dinners and taxi rides etc. (everything other than the accommodations and flights) were surprisingly lower than what we were expecting, coming from Toronto. For someone who is excessively sensitive to price and value, this was a welcome surprise and enhanced my enjoyment of the trip. As I mentioned earlier, Quebec is a historic city, so much of the entertainment in the tourist area is centered around viewing historic sites. If you are not such a history buff, Quebec can be very nice, but don’t expect that you will have a Vegas style trip if you go to Quebec. Here is TripAdvisor’s suggestions on what to see and do in Quebec. In general, we found that the Old Town is divided into Upper and Lower portions. Spend some energy in both and enjoy the staircases that take you between the 2 areas. As mentioned above, we went on a scavenger hunt through the city. I found that The Heir to The Lily scavenger hunt was good fun and would work for any age. It consisted of following clues that lead us around to the historical sites in the cities. There was a bit of wordplay required and some understanding of French definitely helped, but I wouldn’t shy away from doing one of these if you think it might be too hard. Having just watched Jeopardy’s Tournament of Champions, we were actually prepped for something significantly harder. If I were to go again, I would try the other one Champlain’s Prophecy. Quebec City is known as a foodie city. In fact, it has the most restaurants per capita in Canada. That should tell you something about the restaurant culture there. While I didn’t check out every place in the city, I can comment on where we did. We tried a few nicer restaurants, a greasy spoon and the infamous McDonalds coffee. When we arrived on Friday night, it was brutally cold and we were interested in a hearty Quebec meal. 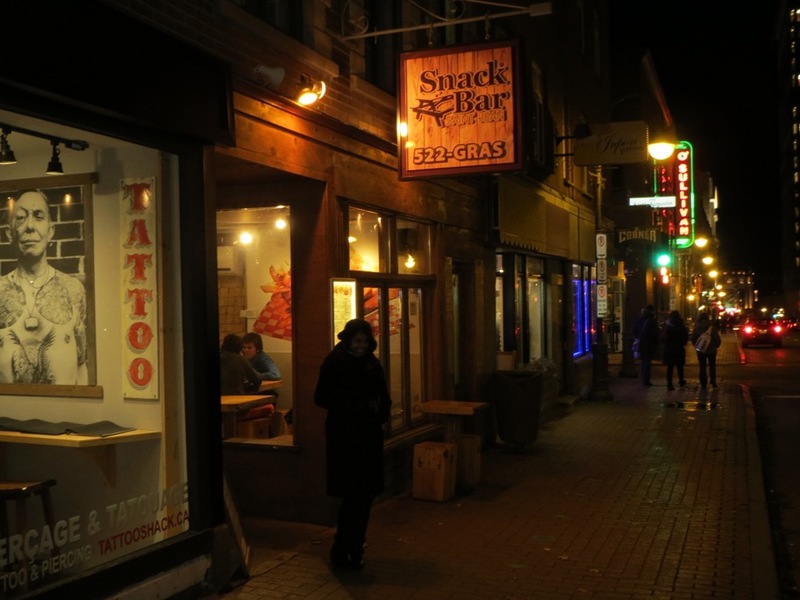 The hotel suggested a poutine at Snackbar, on St Jean. While they had many creative poutiness, we opted for the tried and true standard cheese and gravy poutine. We paired that with a Chicken Salad sandwich and that really hit the spot. We also had a great time chatting with the owner. It is just a great greasy spoon and if we had gone out late, this would have been a great late night find. The owner at Snackbar suggested we check out Chez Boulay Bistro for our Saturday night dinner. She said that if she had one meal left, it would be the meat cheek from Chez Boulay. I guess I agree with her as this was my last meal as a single man. Our experience there was amazing. Excellent food. Great atmosphere. Reasonable prices. We had our entrees, wine and dessert and the total came to about $75 all in. This place was a little more hipster and might be the current “hot spot” in Quebec. I am not really sure, but I would definitely suggest it to anyone looking for a nice, affordable, high end meal in Quebec. We stayed at the Chateau Frontenac on Sunday evening, and part of the deal (see the accommodations section in this series) included a $100 dining voucher for dining at the hotel. We chose the Champlain Restaurant as it was the more “upscale” restaurant and probably more appropriate for our first dinner as an engaged couple. A note on dining vouchers: Something to be aware of is that the dining vouchers only discount the food cost but not the tax or tip. Bear that in mind as you will be paying 13% tax and 15% tip out of your pocket. The food was acceptable, but the atmosphere was more “old money” than “hipster”. There was definitely a stuffy air to it, that didn’t feel authentic to who we are. While the food was fine, I personally wouldn’t go there and pay their prices instead of eating at one of the many other eateries in the city for dinner. We had dessert at the Sam restaurant and that was much more our style. We probably would have had a better time had we had dinner here instead, though we are not complaining. The brunch at the Chateau is also at the Champlain, and that was a very nice brunch, including the standard eggs, but also many meats such as smoked salmon. We were very happy with the brunch offerings here. Check out the parts of this series for the information on how we did this for cheaper than you would have though. I have always heard the Quebec was a great city. As for getting engaged, I am not sure that is a good idea. If the food is great, and it is a safe city, enjoy it! Don't subscribe All Replies to my comments Notify me of followup comments via e-mail. You can also <a href='https://www.creditwalk.ca/comment-subscriptions/?srp=3771&srk=2648578ecea05c83754707575dc5a494&sra=s&srsrc=f'>subscribe</a> without commenting.